VoltDB is an in-memory database. Storing data in memory has the advantage of eliminating the performance penalty of disk accesses (among other things). However, with the complex interaction of VoltDB memory usage and how operating systems allocate and deallocate memory, it can be tricky understanding exactly how much memory is being used at any given time. For example, deleting rows of data can result in a temporary increase in memory usage, which seems counterintuitive at first. This chapter explains how VoltDB uses memory, the impact of system memory allocation and deallocation functions on your database's memory utilization, and variables available to you to help control memory usage. Persistent memory is, as you might expect, the memory used for storing actual database records, including tables, indexes, and views. The larger the volume of data in the database, the more memory required to store it. String and varbinary columns longer than 63 bytes are not stored in line. Instead they are stored as pointers to the content in a separate string storage area, which is also part of persistent memory. Semi-persistent memory is used for temporary storage while processing SQL statements and certain system procedures. In particular, semi-persistent memory includes temporary tables and the undo buffer. Temporary tables are where data is processed as part of an SQL statement. For example, if you execute an SQL statement like SELECT * FROM flight WHERE DESTINATION='LAX', all of the tuples meeting the selection criteria are copied into temporary tables before being returned to the initiator. If the stored procedure is multi-partitioned, each partition creates a copy of its tuples and the initiator merges the multiple copies. The undo buffer is also associated with the execution of SQL statements. Any tuples that are modified or deleted as part of an SQL statement are recorded in the undo buffer until the transaction is committed or rolled back. Semi-persistent memory is also used for buffers related to system activities such as snapshots and export. While a snapshot is occurring, a certain amount of memory is required for overhead, as well as copy-on-write buffers. Normally, snapshots are written directly from the tables in memory, thus requiring no additional overhead. However, if snapshots are non-blocking (performed asynchronously while other transactions are executing), any tuples that need to be modified before they are written to the snapshot get copied into semi-persistent memory. This technique is known as "copy-on-write". The consequence is that mixing asynchronous snapshots with frequent deletes and updates will increase the memory usage. Similarly, when export is enabled, any insertions into export streams are written to an export buffer in semi-persistent memory until the export connector sends the data to the export target. Temporary memory is used by VoltDB to manage the queueing and distribution of procedures to the individual partitions. Temporary memory includes the queue of pending procedure invocations as well as buffers for the return values for the completed procedures (until the client application retrieves them). Figure 9.1, “The Three Types of Memory in VoltDB” illustrates how the three types of memory are allocated in VoltDB. 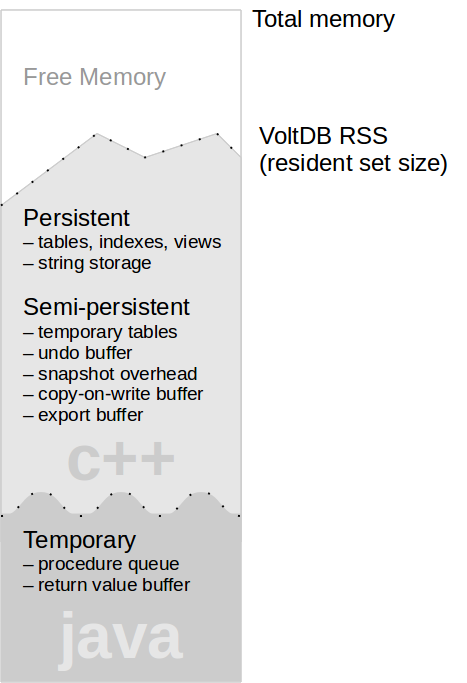 The sum of the persistent, semi-persistent, and temporary memory is what makes up the total memory (what is referred to as resident set size, or RSS) used by VoltDB on the server.